the images never seen before: the making of !! And since these actresses love the cameras, our next project will be about music: we are going through some lyrics, checking and learning them, in order to decide the best one to sing together with a self-made coreography. 5th grade. Welcome on board. have you ever really paid attention to all the safety instructions in an aeroplane? Just in case, we would like to welcome you on board, offer you some advises for taking off and landing and, of course, being thankful for flying with us. 1st grade. Bedknobs and Broomsticks. These days we are watching pieces of an old movie: "Bedknobs and Broomsticks" (1971, UK-USA, Walt Disney). Curiously, when we compare the old and new films for children, we find out that the speed of talking and rythm of the speeches is smoothier in the old films. That's why this one was a good choice. We found a lot of animals' vocabulary to practice again with. 5th grade. Sing and learn. Spring came and we feel like singing. So for these days the students are sellecting some songs. After that we work on the lyrics, we sing, we check the meaning and if we feel like we invent a coreography. There are so many songs that we listen to and sing along without knowing the meaning!! Sometimes, after recognizing the lyrics, we change our mind about that soft and melodic song. Here you have some pictures. Enjoy it! 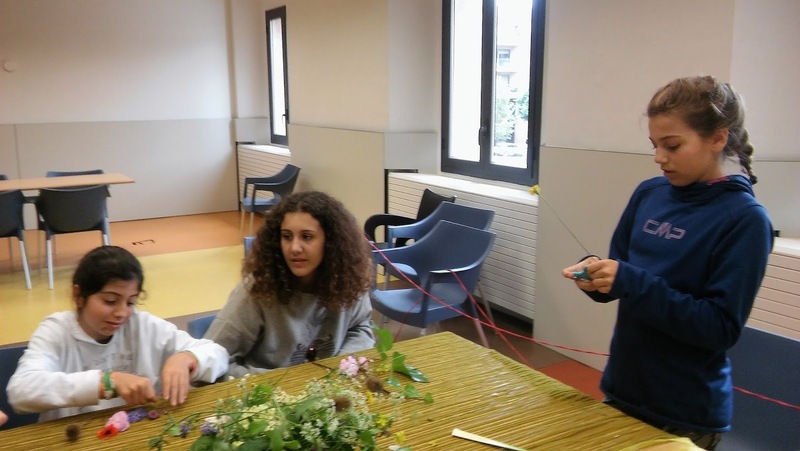 We did an activity where the students were invited to express themselves by choosing a plant and to relate it with what they think about a person they know . It was real fun ! Of course the roses were related to their lovely mothers. Ps the rest is top secret ! As well they had to prepare a speach about a topic and present it to the others. Marta presented the country Kenya and Marina presented Japan. With second grade we have been working on the topic jobs. The idea is to create a small musical , by singing...dancing and acting out the different jobs. We have been singing the song ; I'm a policeman in the town all day long i walk around It's my job ,It's what I do, It's my job , I like it too ! (melody, see you tube; I'm a policeman in the town). As well we played different games to become familiar with the vocabulary. I’m a doctor in the town, all day long I heal around. 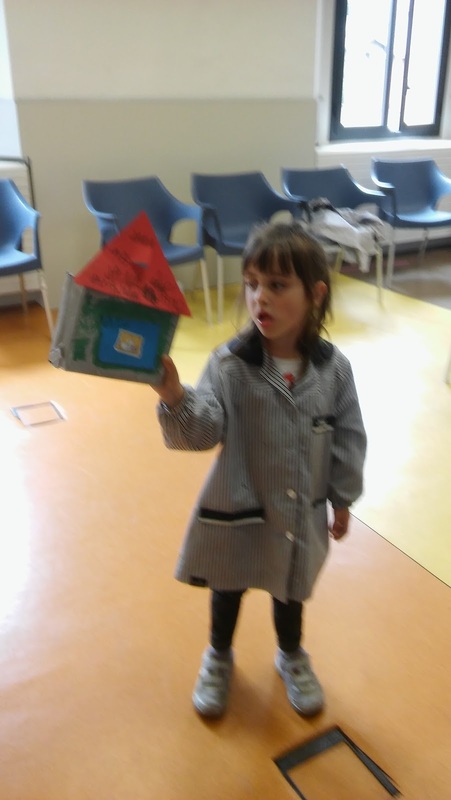 P4 Made a house out of cardboard with a garden !! With p4 we have been working on the topics house and garden. 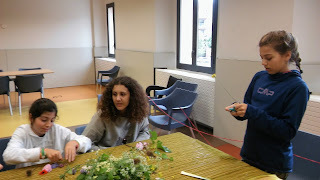 With some students we made a real small garden by sowing real seeds and decorating it with sticks and stones. And we made a house out of cardboard.. The idea of the game was to hide a cat or another picture of an animal in the house. The question , Where is the cat ? The cat is in the kitchen. Where is the cat the cat is in the bathroom. and watching tv ....in the livingroom. It was real fun ! Last weeks we have been working on the topic transport. We made a so called scateboard of cardboard and decorated it with various imatges of transport. Then we played with them throwing them in the air trying to touch different flashcards of transport. We repeated the game changing chairs whereby there is one student in the middle saying for example¨There is a car¨´then the two children who have the flashcard ¨car ¨have to change chairs and the student in the middle has to get one of the free chairs. It was real fun ! Sorry , no pictures...too involved in participating. The vocabulary, There is ; a car a bicycle. a plane, a lorry, a train ,a submarine, a boat.....or There is a car and a plane (then the car and the plane change chairs). The first activity? Let's match the material with the list of English names, so we can enjoy touching and get some specific vocabulary. The second activity? Let's use these "pieces of nature" to create a composition that describe someone real or imaginary. And finally explain/present the result. Composition: is a person that is happy, positive and sweet. 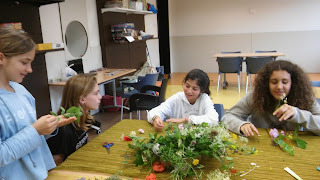 English, Creativity and Fun.... we can't ask for more! 5th grade. The 3rd and final chapter. the 3rd and final chapter of the film. It's been a lot of work, but we finally did it! Hello and welcome to everybody! Yesterday we went to the market to know its products and its stands. The boys talked to the shop assistants and enjoyed walking around the different stands while they were answering some questions about the market and its products. Here below a photography taken at the fish market. Specially thanks to the fishmonger for explaining so many things about fishes to us and for being so patient, too. 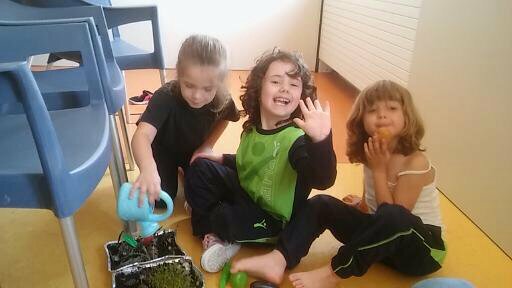 during the last sessions we have been working with food vocabulary. Learning english, once more, is good fun when you combine it with games, drawing, creating food, theatre and real life like going to a supermarket and look for the items of a list. ...and 5th grade took the opportunity to represent things and people by using different elements of the nature. After that, they described the figures and answered to their friend's curiosity. Oh lovely spring, full of magic moments and colour explotions!! We decided to make and decorate butterflies. All this singing our favorites songs! You cannot imagine the wonderful work these kids are doing around this topic. They are so excited about dragons and all this magic world. The past classes we have worked on descriptions, learning parts of the bodies dragon and different nouns. They did such and incredible descriptions of the different dragons they chose. This week we have been working with material from nature. It was lovely the way they used it. The non structured material gives a lot of creation possibilities. 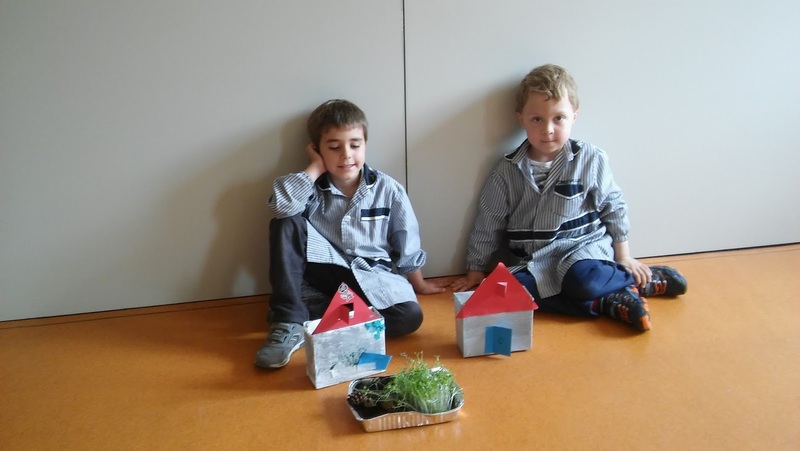 They created their fantastic worlds and imagined all kind of stories, while we took advantage practising different nouns, plants vocabulary and adjectives. Go and look their faces, they were so concentrate doing it! The result was awesome.